Compressive (or compressed) sensing is (as far as I can tell; I have learned everything I know about it from the excellent Nuit Blanche blog) a relatively newly named research subject somewhere around the intersection of signal processing, linear algebra and statistical learning. Roughly speaking, it deals with problems like how to reconstruct a signal from the smallest possible number of measurements and how to complete a matrix (to fill in missing matrix elements – if you think that sounds kind of abstract, this presentation on collaborative filtering by Erik Bernhardssons nicely explains how Spotify uses matrix completion for song recommendations; NetFlix and others also do similar things). The famous mathematician Terence Tao, who has done a lot of work in developing compressed sensing, has much better explanations than I can give, for instance this 2007 blog post that exemplifies the theory with the “single-pixel camera” and this PDF presentation where he explains how CS relates to standard linear (Ax = b) equation systems that are under-determined (more variables than measurements). Igor Carron of the Nuit Blanche blog also has a “living document” with a lot of explanations about what CS is about (probably more than you will want to refer to in a single sitting). Of course, I was far from being the first one to make the connection between compressive sensing and bioinformatics. Olgica Milenkovic had thoughtfully provided a presentation on sparse problems in bioinformatics (problems that thus could be addressable with CS techniques). 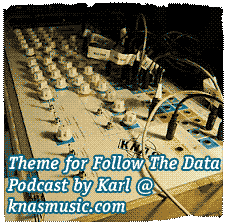 In this third episode of the Follow the Data podcast we talk to Paco Nathan, Data Scientist at Concurrent Inc. The running time is about one hour. Paco’s internet connection died just as we were about to start the podcast so he had to connect via Skype on the iPhone. We apologize on the behalf of his internet provider in Silicon Valley for the reduced sound quality caused by this. An application framework for Java developers to quickly and easily develop robust Data Analytics and Data Management applications on Apache Hadoop. A dialect of Lisp that runs on the JVM. A Scala library that makes it easy to write MapReduce jobs in Hadoop. A simple command line interface for building large-scale data processing jobs based on Cascading. Previously known as Data Without Borders this organisation aims to do good with Big Data. Prediction based insurance for farmers. An interesting take on how programming culture has affected life. Link to episode #2 (http://vimeo.com/29875053) “The use and abuse of vegetational concepts” – about how the idea of ecosystems came to be, sprung out of the notion of harmony in nature, how this influenced cybernetics and the perils of taking this animistic concept too far. A great way to teach kids to code. Another interesting tool for teaching kids to code and build games. Free form virtual reality game. Some info on arduino-based wireless wind measurement project by Karl-Petter Åkesson (in Swedish). A pioneering internet retailer that Paco was one of the founders for. patters and raise awareness of suppressed abnormalities. A very nice application of stream analytics – and as a bonus, the video uses Terry Riley’s A Rainbow in Curved Air as part of its soundtrack (I think). I’ve written about one company that exemplifies how advertising is becoming more data-driven, and now I find there is a Stanford university course about computational advertising. One of the lecture note PDFs defines computational advertising as “A principled way to find the ‘best match’ between a user in a context and a suitable ad“. Although I agree with this O’Reilly Radar blog post in thinking that it’s a stretch to call computational advertising a “scientific discipline”, the lecture notes are nevertheless fun and interesting to read. The instructors are from Yahoo! Research and probably a lot of the material that they cover is actually being used by Yahoo! in some way. Assume I hide a ball in a cabinet with a million drawers. How many drawers do you have to open to find the ball? Sometimes you may get lucky and find the ball in the first few drawers but at other times you have to inspect almost all of them. So on average it will take you 500,000 peeks to find the ball. Now a quantum computer can perform such a search looking only into 1000 drawers. China has a population of 1.3 billion. The US has a population of 0.3 billion. China has averaged an economic growth rate of about 10% over the past 3 decades. The US has averaged 3%. The Chinese government is strongly committed to heavy investment into high tech. From the above premises, one can virtually prove, as in a mathematical theorem, that China in a decade or so will be in a superior position to offer top salaries (in the rich Southeastern cities) to creative, brilliant Westerners to come to China to build artificial brains — much more than will be offered by the US and Europe. With the planet‘s most creative AI researchers in China, it is then almost certain that the planet‘s first artificial intellect to be built will have Chinese characteristics. Some other arguments in favor of this idea mentioned in the article are that “One of China‘s major advantages is the lack of strong skepticism about AGI resulting from past failures” and that China “has little of the West‘s subliminal resistance to thinking machines or immortal people”. Finally, I thought this methodology for tagging images with your mind was pretty neat. This particular type of mind reading does not seem to have reached a high specificity and sensitivity yet, but that will improve in time. Bratton talks about “real-time crime centers” and “hot spot policing” where emerging patterns or trends can be detected early and the area in question can be flooded with police resources. Somewhat in analogy to current healthcare trends, the focus is moving to prevention of crime rather than response to crime. Here is an interesting article about predictive analytics in policing.